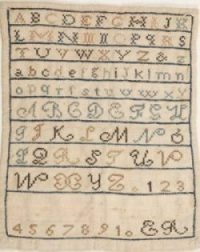 In the 18th century girls at a very young age made SAMPLERS which served not only to master stitches but also to learn numbers and the letters of the alphabet and to reinforce religious beliefs and ideas of proper behavior. this sampler during the decade 1770-1780. MARTHA GRAY. 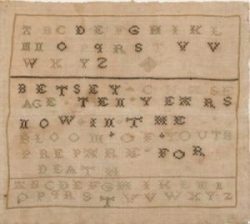 who lived in Philadelphia, was between seven and nine years old when she created the beautiful sampler on the right (1779). She used wool thread in cross and tent stitches on open hole canvas, not woven fabric. Quite an accomplishment for one so young. 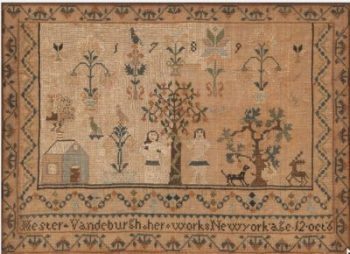 In 1789, HESTER VANDERBURGH of New Rochelle, New York made the above sampler with a religious motif. Pictured in a domestic setting that includes a house; two trees, one of which is laden with apples; birds; a dog and a deer; are two figures most likely intended to portray Adam and Eve. The twelve-year-old girl used silk thread worked in a cross stitch. 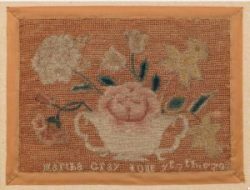 BETSEY CHASE, in 1789, using cotton thread worked in a cross stitch on linen fabric, copied a verse intended to remind her of her mortality. On the top and bottom is the alphabet. The words in the center are “Betsey Chase age ten years now in the bloom of youth prepare for death.” Nice thought!! No information about where she lived.